NAPA, California, May 17, 2018 /PRNewswire/ — Today at its annual user conference, JFrog, the DevOps technology leader, launched Enterprise+, a universal software binary platform that provides continuous updates for virtually any language and destination. Enterprise+ is optimized to manage the lifecycle of binaries for modern cloud-native applications — including container and serverless — as well as traditional IT applications and can be used for mobile development and IoT devices. It also includes comprehensive analytics and security features to satisfy the demands of modern global technology customers. 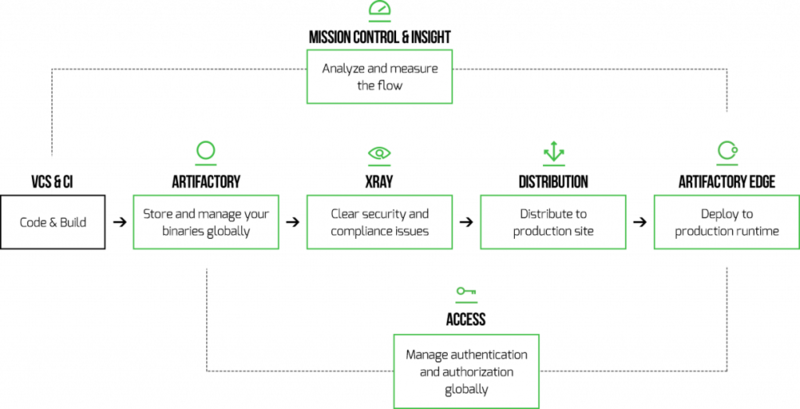 JFrog Enterprise+ accelerates the software release cycle with an end-to-end pipeline for managing and tracing the flow of binary artifacts from code to production deployment. The platform provides a complete solution for covering all the steps involved in creating a secure, trustworthy, and traceable software release in a multi-site development environment. JFrog’s Enterprise+ platform offers organizations the ability to gain full control over the storage, promotion, security, and distribution of their binary release to remote endpoints. A unified dashboard provides visibility and measurable analytics throughout the process, alongside integrated authentication and authorization management that delivers global security across different regions. JFrog platform release included an intensive BETA program with its key customers, such as Citi Bank, Capital One, Fidelity, Ericsson, Apple, Align Software, and others. With more than 4,000 customers and over 3 billion downloads per month on its binaries hub, JFrog is the leading universal solution for the management and distribution of software binaries. JFrog’s four products, JFrog Artifactory, the Universal Artifact Repository; JFrog Bintray, the Universal Distribution Platform; JFrog Mission Control, for Universal DevOps Flow Management; and JFrog Xray, Universal Component Analyzer, are used by Dev and DevOps engineers worldwide and are available as open-source, on-premise, and SaaS cloud solutions. Customers include some of the world’s top brands, such as Amazon, Citi Bank, Credit Suisse, Google, Facebook, Uber, Netflix, Twitter, Adobe, VMware, Slack, and Spotify. The company is privately held and operated from the United States, Israel, India, China, and France. More information can be found at jfrog.com.